What matters most in retirement is how much money comes in the door every single month. That’s why this blog – and its sponsor, the Center for Retirement Research – hammers away at the wisdom of delaying when you sign up for Social Security in order to increase the size of your monthly checks. So here’s a very quick project for the long Thanksgiving weekend: insert your birthday and earnings into this new online tool to get an anonymous, back-of-the-envelope estimate of how much a delay is worth to you. The age you claim your benefits is crucial, because two out of three households rely on Social Security benefits for more than half of their retirement income. Yet the majority of people still sign up before they’re eligible for their full benefit, which is age 66 for most baby boomers. Monthly benefits are increased for every year of delay, up to age 70. People do not like to hear advice from their “elders.” But shouldn’t retirement be an obvious exception? The options for what most workers can do to salvage their retirement finances rapidly narrow as they get closer to retiring. After 50 or so, it’s also tough to find a better job, and only so much can be saved in short bursts – retirement saving requires years of diligence. If you’re still listening, the following is sage advice drawn from two recent New York Life surveys of older workers on the cusp of retirement and octogenarians. Workers in their 50s and early 60s said they started saving too late for retirement. They put the “magic age” at around 26. Financial planner Diahann Lassus views as misguided the “obsession” some baby boomers have with paying off their mortgage before they retire. But Jane Rose, who has done just that with the loan on her home in Cherry Hill, New Jersey, has discovered how liberating it is. “I’m such a happy camper,” she said. The math versus the emotion, the rational versus the irrational, head versus heart – that’s a simple way of framing a complex issue. Many boomers looking ahead to their retirement years are grappling with whether to pay off their mortgage before they retire or shovel any spare funds into their employer’s 401(k). Both arguments have merit for very different reasons. First, the math. The alternative to paying off the mortgage – extra funds for the 401(k) – will provide more savings, more net wealth (assets minus debt), and more financial flexibility in retirement, according to many financial planners and an economist here at the Center for Retirement Research (CRR). “There are few problems in life that aren’t mitigated by having a lot of money,” says Anthony Webb, CRR senior economist. Indeed, directing extra contributions to a 401(k) is particularly attractive to well-heeled boomers in high tax brackets, who benefit the most from having both tax breaks: the federal mortgage interest deduction and the 401(k) tax deferral for contributions. This will not surprise you: men have more money saved for retirement than women. Men averaged $123,262 in their defined contribution plans, compared with $79,572 for women, according to a new report by Vanguard based on its 2014 recordkeeping data. 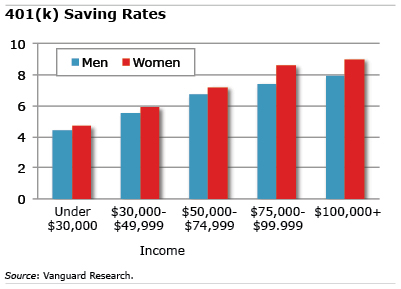 But these figures hide a larger truth: women are actually better at saving for retirement. Young’s research found that women are 14 percent more likely to enroll in a voluntary workplace retirement savings plan. Women save 7 percent of pay, compared with 6.8 percent for men, controlling for wages, job tenure, and plan design. They also save at higher rates than men at every income level. Older workers with jobs that give them a high degree of control and influence or a sense of achievement and independence tend to be healthier, new research finds. The specific benefits of these “psychosocial” aspects of work include lower blood pressure, musculoskeletal agility, better cognitive functioning and improved mental health. They’re equivalent to the health benefits associated with vigorous exercise three times a week, the study found. Researchers long ago established a strong connection between poor health and jobs requiring strenuous physical activity in harsh conditions. This new study looks at a wide array of psychosocial job characteristics increasingly relevant in the New Economy, as well as revisiting the grueling physical characteristics prevalent in the manufacturing-driven economy of the past. Lauren Schmitz, a postdoctoral fellow at the University of Michigan, tracked 50- to 64-year-old men working full-time over an 18-year period. The researcher used the Occupational Information Network, which gauges some 970 occupations, to identify the current physical and cognitive demands of their jobs, as well as their physical environments. Controls included factors such as the workers’ childhood health, smoking, exercise, mid-career earnings, and their parents’ socioeconomic status. The study revealed a strong association between the men’s health and the psychosocial characteristics of their employment. Further, workers who were required to make “high-stakes decisions” had better cognitive functioning. Interestingly, only weak links were found between declining health and the environmental hazards and strenuous physical demands that the workers faced late in their careers.